Faith Lutheran’s last regular season conference game with the Trojans went down as expected, they won 10-0. What was not expected was the way the umpires called the game. There were a couple of controversial calls in the game, one in favor of the Trojans and one not. Trojans coach Eli Armendariz was not into bad-mouthing the umpire calls after the game. He said regardless of the calls and the loss, the Trojans had improved immensely since their last meeting. He pointed out this time that the girls were hitting more, 4 hits as opposed to 2 hits. He also said the team treated Wednesday’s game against Faith Lutheran as a playoff game. 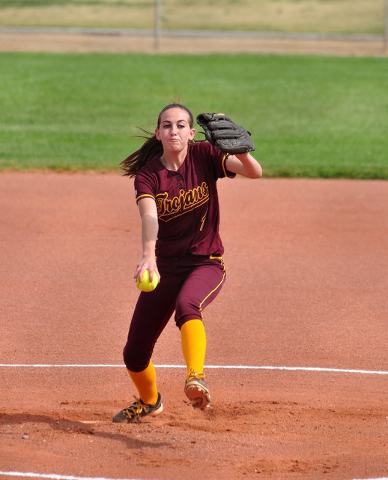 The coach then talked about his sophomore pitcher who threw a perfect game against Clark and had a good first three innings against the talent-laden Crusader team. She only gave up one hit in those three innings and one run. The coach also added if the Trojans defense was a bit more experienced, the game would probably be only a 5-run loss according to coach Armendariz. And then there were the questionable calls. In the second inning, after going 1-2-3 in the first, the girls tried to get something going by playing some small-ball. 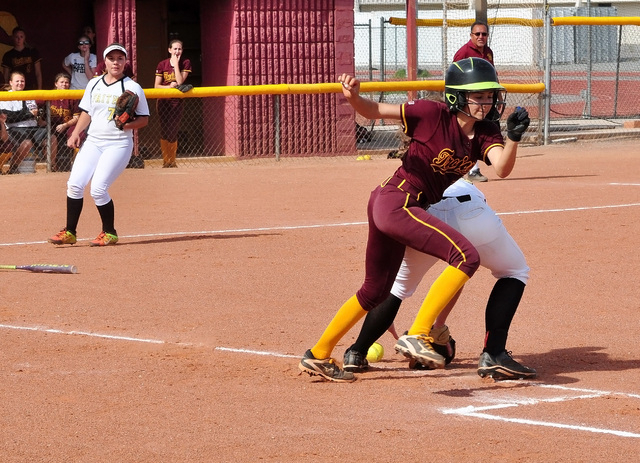 Pahrump was at bat with two outs, Pearson came up and laid down a good bunt to the first base line. Crusaders first baseman Samantha Jack went to field the ball and while doing so blocked Pearson’s path on the base line causing her to veer off the baseline. Faith Lutheran (24-7 overall, 11-3 Sunset League) argued it was the only way to get the runner and therefore Pearson was out. The umpire didn’t agree and called interference by the pitcher, awarding Pearson first base. The rule states if “a fielder not in possession of the ball or not making an initial play on a batted ball, impedes the progress of a runner or batter-runner who is legally running bases.” The Trojans couldn’t capitalize on the call though. The other questionable call was in the top of the fourth inning. In this inning, the Crusaders started off with a ground out and it looked as if the Trojans were going to retire the side quietly. Then the second batter hit the ball to center field and Andi Bishop made a great throw to second base for what appeared to be the second out. Instead, the umpire said Trojans second baseman Evandy Murphy didn’t have her foot on the bag and she was called safe. The Trojans got the next batter to fly out, which would have been the third out. It went downhill from there. From that point on, Faith took advantage of the umpire call. They singled two batters home and got two more runners on base due to mental errors and drove those runners in too. In all they scored four runs, to make it 5-0 Crusaders. The Trojans (15-9 , 8-5 ) will start playoffs on Tuesday at Boulder City (24-6, 13-0 Sunrise League), the first-place seed in the Sunrise League. 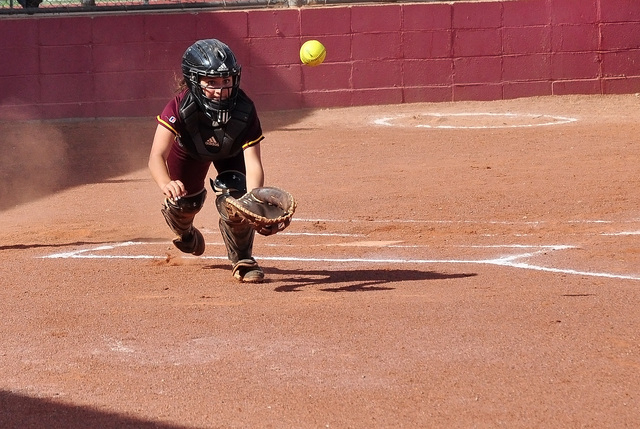 The Trojans were at Cheyenne on Thursday to finish their 10-7 game, which Pahrump was leading when the game was called due to rain in the top of the fifth. The game was past deadline. Today the team is at Bishop Gorman (16-15, 10-8 Division I Sunset League) for a non-league game at 3:30 p.m.
Trojans batting: Jessica Pearson 2 singles, Jackie Stobbe 1 single, Amaya Mendoza 1 single.